The PAX series Panel Meters offers many features and performance capabilities to suit a wide range of industrial applications. The 4½ digit meter employs advanced technology for stable, drift free readout, while incorporating features that provide flexibility now and in the future with Plug-in option cards. The Plug-in card options allow the user to configure the meter for present applications, while providing easy upgrades for future needs. 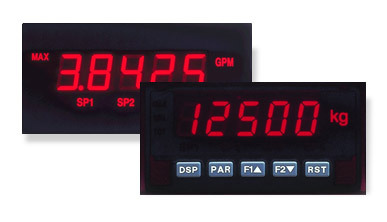 The PAX Panel Meters employ a bright 0.56" LED display. The unit is available with a red sunlight readable or a standard green LED. The intensity of display can be adjusted from dark room applications up to sunlight readable, making it ideal for viewing in bright light applications. The PAX Panel Meters provide a MAX and MIN reading memory with programmable capture time. The capture time is sued to prevent detection of false max or min readings which may occur during start-ups or unusual process events. The signal totalizer (integrator) can be used to compute a time-input product. This can be used to provide a readout of totalized flow, calculate service intervals of motors or pumps etc. The totalizer can also accumulate batch weighing operations. The PAX Panel Meters Plug-in options cards are available for Relay Outputs (Single, Dual & Quad), Open collector logic outputs, Analog outputs, Communication Function (for RS-232, RS-485, MODBUS, DeviceNet, Profibus-DP). Once the meters have been initially configured, the parameter list may be locked out from further modification in its entirety or only the set point values can be mad accessible. The PAX Panel Meters have been specifically designed for harsh industrial environments. With NEMA 4X/IP65 sealed bezel and extensive testing of noise effects to CE requirements, the PAX meter provides a tough yet reliable application solution. The PAX Panel Meters can be configured using the powerful, complimentary CRIMSON software. The PAX Series Panel Meters are available in both Analog & Digital Input types. The Red Lion PAX Series panel meters offer the capability to add and change option cards as your application and communications requirements change. These Field-upgradable solutions are the perfect alternative to competitive meters that force you to order a new meter every time conditions change. With the Red Lion PAX meters, simply order the option card you need for easy, plug-and-play installation. The PAX meters are geared to handle your challenging applications and changing requirements.